Used to clean utensils, made of magnetic grade stainless steel which is tough on utensils & soft on hand. 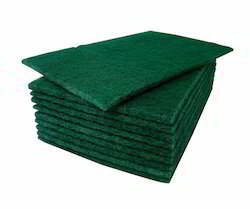 It does not catch rust & more durable than any other such kind of ordinary scrubber. We have marked a dynamic position in the market by providing the finest quality range of Plastic Pot Scrubber. Prodcut Name: Scoth Brite 2in 1. With an established reputation in this market, we are involved in providing Handle Pot Scrubber. No more standing at the sink for hours as we offer Pot Scrubber for Dishwashing. Our consistent endeavor to generate good quality products has made us one of the esteemed Pot Scrubber, nylon pot scrubber and crocheted pot scrubber manufacturer and exporter in India. Keeping in mind the customers demand our products are available in different sizes and are easy to grip. 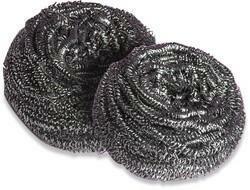 We fabricate a broad range of pot scourers which finds application in various domestic and industrial establishments. Our range is made of stainless steel which makes it resistant to corrosion. We check our range stringently on various parameters so that no discrepancy is seen at clients end. Our company is a provide of a wide assortment of various consumer products. These products are fabricated in our own suppliing unit that is well equipped with latest machines and equipment to cater to the specified requirements of our clients spread across the globe. Our product range encompasses safety pins, ear buds, candles, matches and scourers. Our company is provide of a wide assortment of various consumer products. These products are fabricated in our own supplying unit that is well equipped with latest machines and equipment to cater to the specified requirements of our clients spread across the globe. Our product range encompasses safety pins, ear buds, candles, matches and scourers.